Owning a pet sitting company is awesome. I get to come into contact with all kinds of different animals and it is so much fun to be around them. One of the few bad things is when one of them passes away. It’s hard on me and I can see what it does to not only the families of the pets, but the other animals in the family. 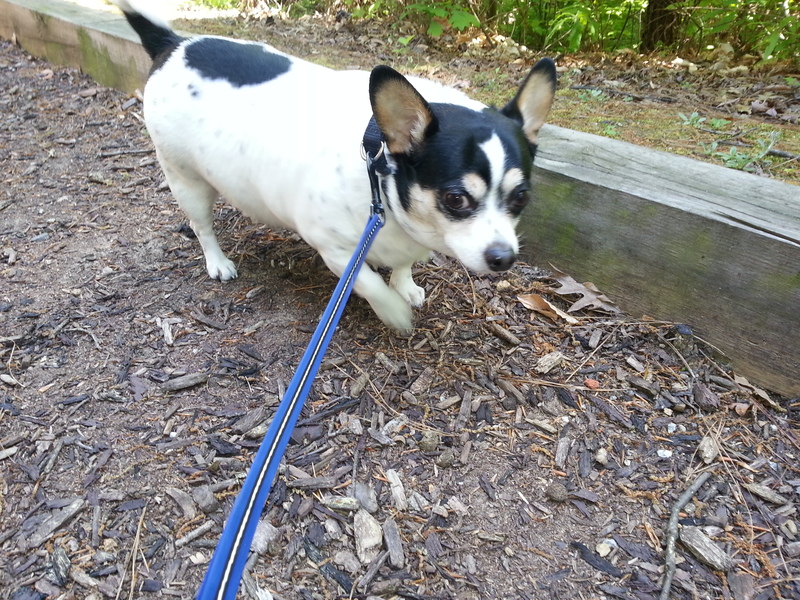 Jack enjoying a walk on the nature trail. He passed away in May. Sunday, June 14 is World Pet Memorial Day, and I thought that was a good time to address something that I have seen several clients dealing with lately. A couple of weeks ago, I lost 3 client dogs. Two of them were 2 of the dogs that I care for the most. In both of those situations, the owners had to make the hardest decision a pet owner has to make. Has the pet’s quality of life deteriorated to the point where it’s time to say goodbye forever? They both felt like it had, and without much hesitation, they had people come in and put the dog down. I have seen other clients that may not have acted in the pet’s best interest. Several times, we were called in to help them take care of a dog. Most of the times they need help with a dog because cats are so independent or you never realize until too late how bad off the cat is. In most of these cases the dog needed extra help that the client was not able to do physically or because it needed so much attention they got us involved. To be fair, we got involved after things had already happened and I didn’t know the client, the pet, or the back story. In these cases we are happy to help make things as good as possible for the pets. rescued when he was 4 and half, 7 years ago. When I first started taking care of Johnny, he was always pretty calm and laid back. I’d walk him 4 times a day and he didn’t take too much encouragement to get going on the walk. He loved to eat and was always ready for a treat. In December 2012 he was diagnosed with cancer. It was caught early on and that made the decision to treat it easier for her. “It was the whole process,” said Angela. “They would resect the tumor but he must have the treatment, too. He had to have it all.” The tumor was on his shoulder, so it was easy to get to. He was going to have 15 weeks of chemo and radiation. The doctors said typically you can expect about 18 months after this treatment program. 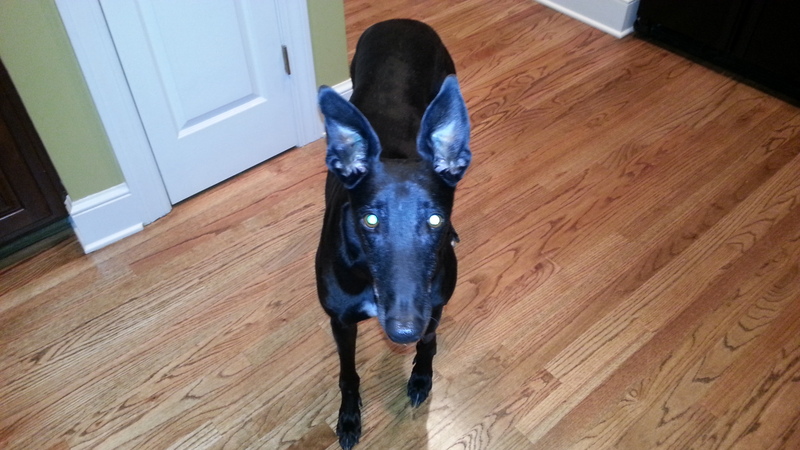 About a year and half ago, Angela had moved into a home that had a fenced yard. 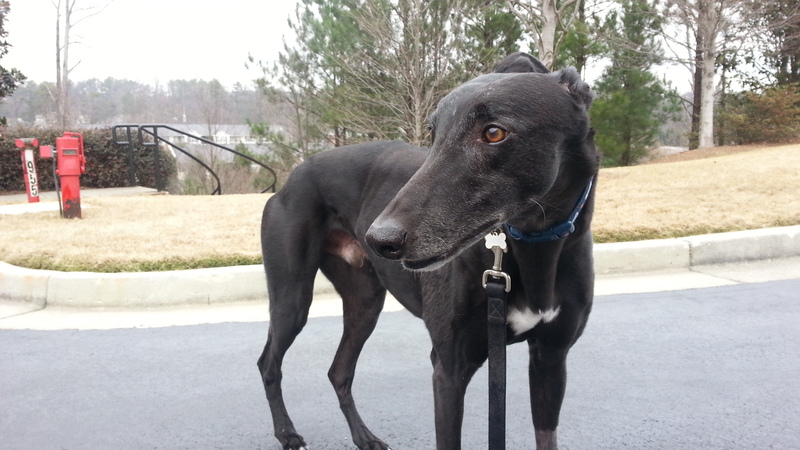 In addition she adopted another greyhound, Payton. Johnny loved having the companionship from Payton. With the fenced in yard, they could play together off the leash. It was so cool to me seeing Johnny run that much. They would take off and run around the yard and it was quite impressive. 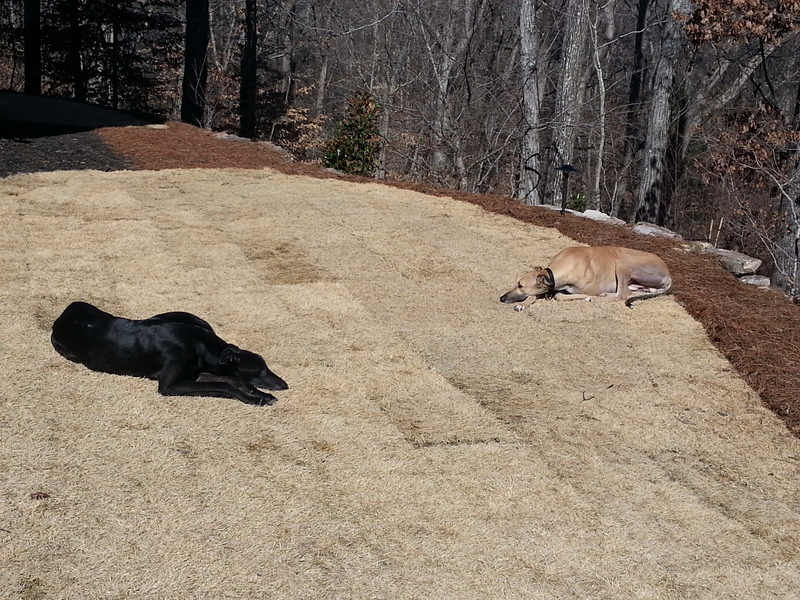 Johnny and his new pal Payton enjoying the winter sun after a few laps around the yard. Angela feels good about the decisions she made with him. She got 26 months after the initial cancer surgery, when they said 18 was best case. Payton has had a tough time without him, but he just got a new brother, so he is getting a chance to show him the ropes. She is also putting his memory to good use. She has set up a page on justgive.org so people who loved Johnny can make a donation to his favorite charity. It has already raised more than $1000 in just a few weeks. Everybody goes through different emotions with their pet when they are dealing with a terminal illness or just old age. I’ve seen people spend a lot of money on treatments to keep the pet alive, but that may not have been in the best interest of the pet, because of the pain they were enduring. I think it’s important to get some opinions from your vet and other people you trust who know the dog if you just can’t make the decision to say goodbye. Sometimes, like Angela with Johnny, you just know it’s time. A blast of Arctic air has blown into the southeast. Overnight temperatures are forecast for the low teens Wednesday and Thursday nights in the metro Atlanta area. This frigid air mass will make it all the way down to Florida, with temperatures forecast to get to the mid 20s in central Florida on Thursday. With wind chills around zero, that can be dangerous not only for you, but for your pets. The thing about animals, as all owners know, is that they have to do their business, regardless of the conditions outside. Animals can get frostbite and other cold weather injuries just like humans. 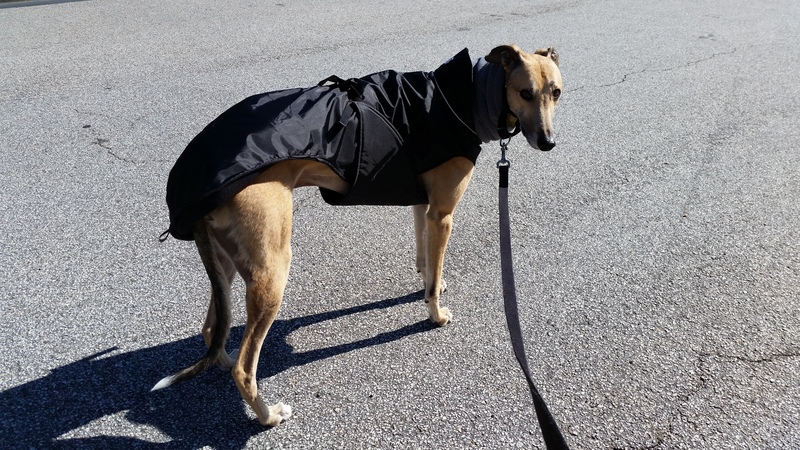 You will be bundling up before you go outside, so you want to do what you can to prepare your pets as well. Smaller dogs and cats are much more venerable to the cold. 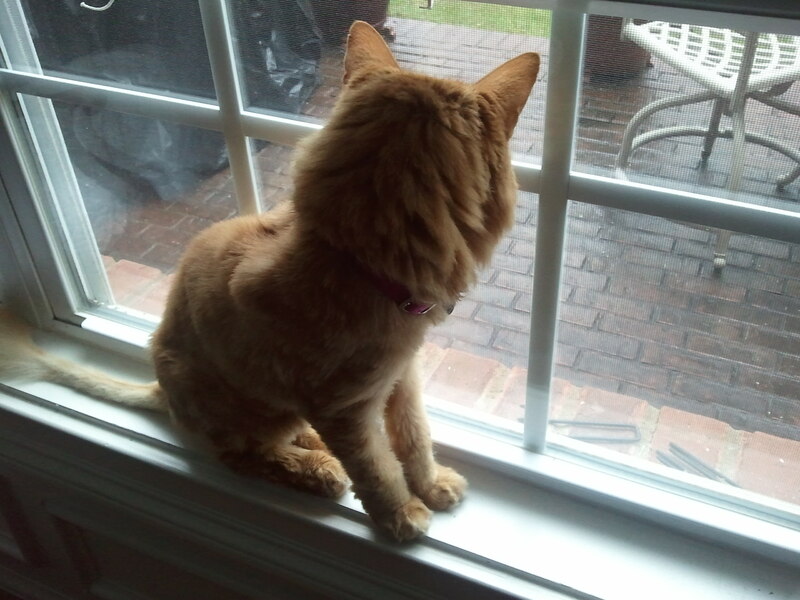 If you let your cats outside, don’t until things warm up. As for the dogs, use a sweater or other jacket for them if you have one. I can’t offer a suggestion on getting them on dogs that won’t want to wear a sweater. Once they do their business, come in as quick as possible. The areas that are at most risk are the ears, paws, scrotum and tail. Tissue can freeze if their body temperature drops to 4 degrees below their normal temperature. Give your dog a quick exam when you get back in to see if anything looks different. If the dog is still shivering when you get back in, wrap it up in a towel that has been warmed in the dryer. If your grass has frost on it, you may want to wipe the paws in a warm towel to make sure there aren’t any ice or frost crystals stuck in the pads. Skin will become swollen, red and painful if your dog has been affected. If your pet is showing any of these symptoms, the affected body parts should be slowly warmed with wet towels. Get it to your vet or an emergency vet clinic as soon as possible to prevent long term damage and ward off infection. Don’t rub or squeeze the affected area because it will be painful for the pet. As with any first aid you provide to your dog, muzzle it to make sure it won’t lick the affected areas or bite you as you tend to it. It’s important for you and your pet to stay hydrated in cold temperatures and that will help ward off cold weather injuries. Another thing to keep in mind is that if you park your car outside outdoor cats like to climb in the engine to try and stay warm. Tap your hood a few times before you start your car to make sure there isn’t one in there. Just remember to use common sense and if you don’t want to do something because of the cold, your pet likely won’t want to do it either. 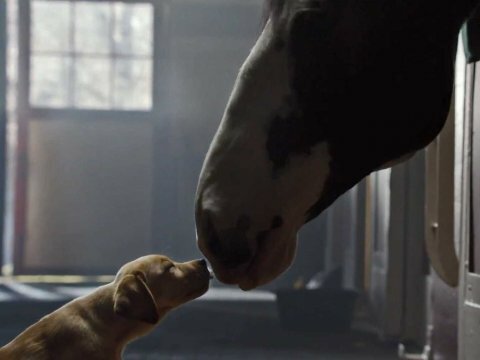 Unless you’ve been stuck in a frozen snow drift or on an Atlanta interstate for the past few days you know this weekend is the big, huge event that everyone looks forward to and spends all day Monday breaking down: The annual Pets and Product Placement Presentation known as Super Bowl Commercials. I post a lot of things on my Facebook page about how people use animals to promote their business or product, so I think it’s neat how the commercials do this. When I was researching this, I found several groups that have their own top 10 lists for Super Bowl commercials involving animals. I’m not going to bore with you my top 10 list because I don’t think I could even name 10 Super Bowl commercials with animals. I will say that my favorite one from last year is the one with the Clydesdale trainer reunited with the horse he raised as a foal. I’m a big sports fan, so I’m watching the game and using the commercials to get another drink or fill up my plate with more food. 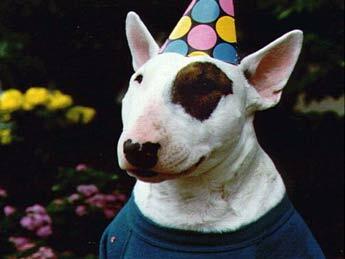 But there have been some memorable animals that have debuted during the Super Bowl. I did come up with a few memorable spot, all from Anheuser-Busch: Spuds McKenzie from the 1987 Super Bowl, the Budweiser Frogs from 1995, and of course the Clydesdale’s football game. However animal lovers may be a little disappointed on Sunday. Variety magazine says that celebrities will be the stars of most of the commercials this year. You may have already seen the Bud Light commercials promoting Arnold Schwarzenegger’s commercial. That’s what we’ve come to, promos for commercials. Animal lovers shouldn’t stay away from the game. After all there are 2 animal teams playing. Audi is going the celebrity and animal route in their commercial. There will also be a sequel to the Budweiser commercial I mentioned earlier. This one has a puppy in it and you can get a preview here . One reason these commercials are so popular is because we love animals so much and can relate to many of these experiences. And let’s face it, some of these animals are just cute and you can’t take your eyes off them. I think that animals will always have a place in commercials because so many people love animals and marketers want to have their products associated with them. Enjoy the game and let me know what your favorite commercials have been in the past and what you think about this year’s commercials after the game. Most bloggers on Tuesday were talking about the Syracuse center being declared ineligible for the tournament, but I want to update the readers here on one of the mascots who won’t be able to make the trip to the tournament because of an injury. 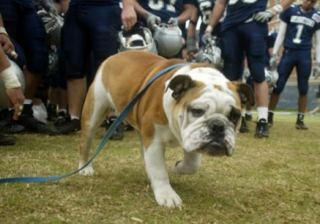 Jack the Bulldog, from Georgetown University Traditions. We wish Jack a speedy recovery and hope there aren’t any other injuries to mascots, or players during the tournament. Most of us love animals. We all know that. Many colleges seem to love animals too. So much in fact, they have adopted an animal as their mascot. Of the 68 schools playing in the NCAA Men’s basketball tournament this week, 38 have an animal nickname. Three of the ones that don’t have an animal nickname (Alabama, Georgetown, UNC) have an animal mascot. So if you’re having some trouble filling out your bracket, maybe I can help you based on a team’s mascot. There is a wide selection of animals represented from the Badger (Wisconsin) to the Bruin (Belmont). Some are closely identified with their state like the Longhorn (Texas), the Gator (Florida), the Buffalo (Colorado) or the Grizzly (Montana). There are some odd colored animals like the Golden Eagles of Southern Miss and Marquette. The Bears from California are Golden. The ones from Baylor are not. Some are vicious like the Bulls (South Florida) and some are kind of cute like the Jackrabbits (South Dakota State). Some are fast, like the Racers from Murray State (a thoroughbred is their mascot) and some are just quick, like the Wolverine (Michigan). You are more likely to find a Ram around the Colorado State campus than on the Virginia Commonwealth campus in Richmond. Most of these wouldn’t be animals you’d want around the house as a pet. But there are 7 kinds of birds, some of which you may find in your backyard like Cardinals (Louisville and Lamar), Blue Jays (Creighton) or Blackbirds (LIU-Brooklyn). In addition to the Golden Eagles, there are Mountain Hawks (Lehigh) Owls (Temple) and Jayhawks (Kansas). 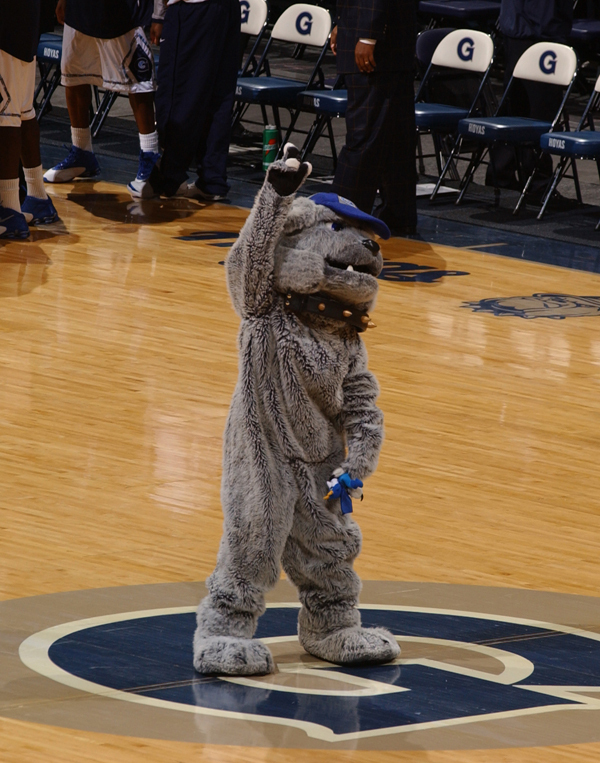 There are 3 dog breeds, Husky (Connecticut), Bulldog (Gonzaga and UNC-Asheville) and Greyhound (Loyola, MD). There’s also a Wolfpack (N.C. State). The cats are more numerous and there’s a wider variety. The most popular are Wildcats (Kentucky, Kansas St. and Davidson) and Tigers (Missouri and Memphis). There is also a Bobcat (Ohio), a Catamount (Vermont), a Bearcat (Cincinnati) and a Cougar (BYU). We are lucky that the tournament committee made the controversial decision to exclude Drexel because I didn’t want to debate if a Dragon is an animal or not. The mild winter must have made it tough for the Penguins of Youngstown State to play basketball very well this season. I’m sorry the Kangaroos of Missouri-Kansas City didn’t make it. That would be one team I’d pull for. For the millions of Americans who own Labrador Retrievers you may be surprised that of all the colleges in this country, none of them have chosen this lovable dog to be their mascot. Let me know what your favorite mascots, not schools, are in the tournament. Enjoy the tournament and may your bracket win! Fetch! 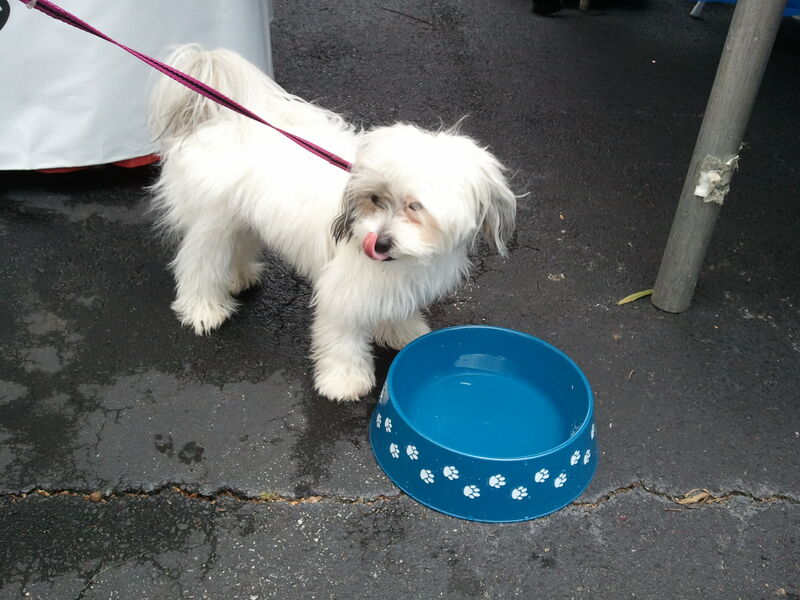 Pet Care of NW Atlanta provides in-home pet care and dog walking as well as cat care services in Roswell, East Cobb, Marietta and Woodstock, Georgia. This time of year we’re seeing the lawn service trucks come back into neighborhoods to spray yards with weed killer and fertilizer as dormant lawns come to life in the warmer temperatures. 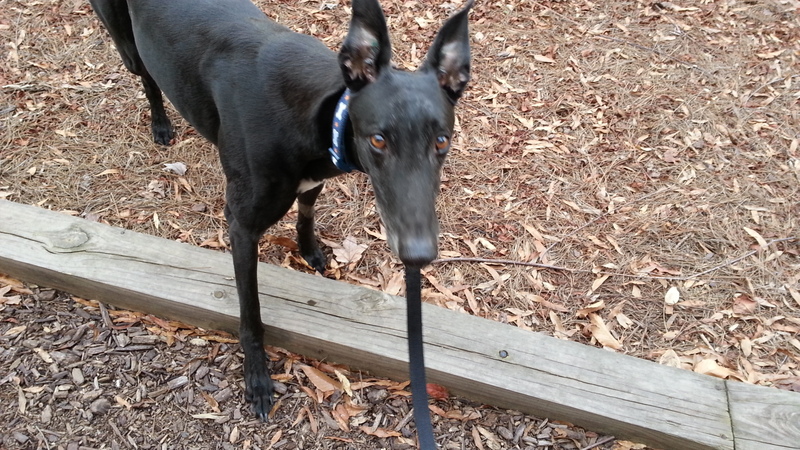 That makes the yards look great but it can be dangerous for your pets. 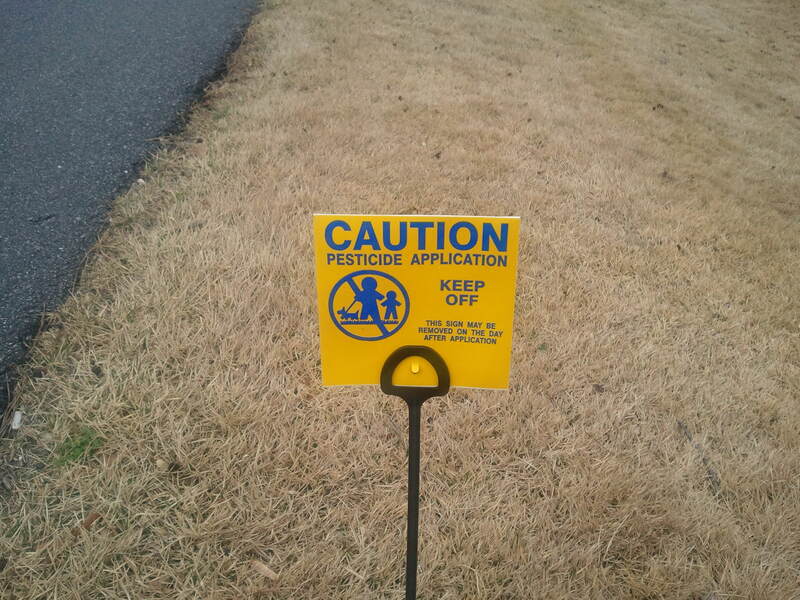 When you see the signs in a yard that say it’s been serviced, you know not to let your pet walk into that yard. But even by keeping your pet out of the grass, the weed killer can get on his paws. If it’s a windy day, the spray can get on sidewalks or the road, but even it’s not windy the spray can go where it’s not intended. If the pet gets fertilizer on its paws it will track in your house where it could be picked up by others. Your pet may lick its paws and ingest the poison. There is something quite easy for you to do to prevent this. 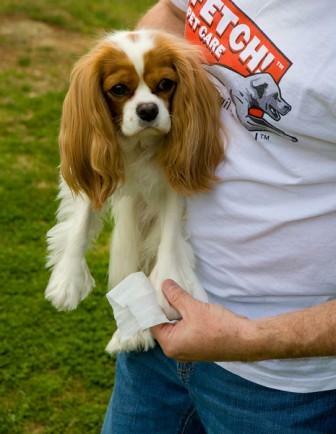 You can keep disinfectant wipes by your door and wipe off your pet’s paws before it goes back in the house. As part of your pet and family first aid plan you should have the local poison control center number readily available. In metro Atlanta call 404-616-9000. Here’s the link to the website. What’s the Best Dog Movie?